It looks like there are changes coming to Google Play Store which are major changed and it’s coming soon (jump on hype train with us), according to Google’s UI Engineer, Kirill Grouchnikov, a man of #pixelpushing the early goodies which gets launched in few days. Grouchnikov posted screenshots of the update to his Google+ this morning, screenshots that shows a major UI overhaul on the main page. As you can see in the shots, there will be a splash screen followed by an introduction to the new layout, which will be broken out into “Apps & Games” and “Entertainment” sections. The change will create two main tabs on the Play Store home page, one for apps & games and one for entertainment. The end result does create a cleaner look and an spot for the big image at the top of the home page, but it will also mean that instead of having all of the categories right there up front, it will take an extra tap to get to the category you want to browse. From within each, you will now see subcategories like Top Charts, Games, Categories, Family, etc. in the Apps & Games screen. On the Entertainment page, you will then see the familiar shortcuts for Movies & TV, Music, Books, Newsstand, etc. 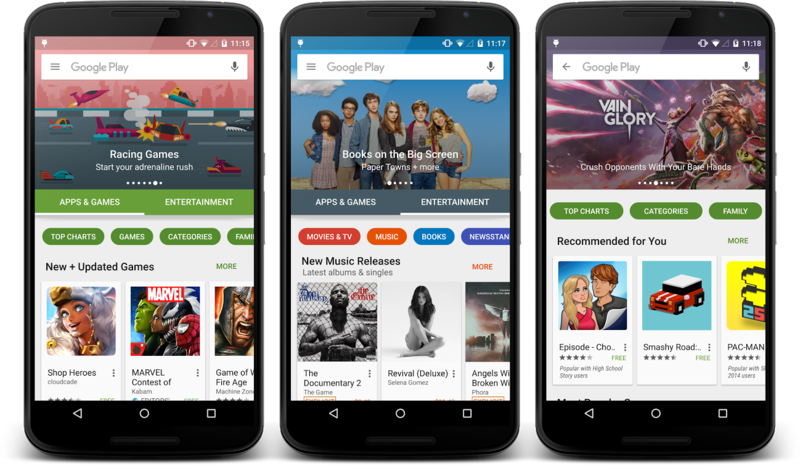 Google also appears to be using the new header space at the top of Google Play to showcase apps, games, movies, or something related to them.